This is an unchanging mucus pattern reflecting a basic low level of oestrogen. It happens early in the cycle for most women with ‘normal’ cycles and is evident for a long period of time while breastfeeding, during peri-menopause and in women who do not ovulate regularly. The fertile pattern is a changing mucus pattern, reflecting a steadily rising level of oestrogen as the woman comes closer and closer to ovulation eg. a women may experience the basic infertile pattern as dryness and notice thick, white, gluggy infertile type mucus. After a few days she may notice that the mucus changes slightly and becomes thinner. For this woman, the basic infertile pattern is a dry feeling with thick, white, gluggy mucus. Any deviation from this should be seen as potentially fertile mucus. This is the day that the mucus changes from the basic infertile pattern. This is the last day that any fertile mucus is noticed. This usually indicates that a pregnancy has not occurred in the previous cycle. Bleeding begins on day 1 of the cycle and continues for a number of days varying from 3-7 in the majority of women. You can’t rely on a period as sign that ovulation has occurred or as an absence of fertility since bleeding occurs as a result of hormonal triggers with or without ovulation. This often happens to women with poly cystic ovarian syndrome. The only indicator that ovulation has occurred is the temperature shift. If you don’t see a temperature shift you should assume that you are still in the pre-ovulatory phase and that you are potentially fertile. This is also known as the follicular phase. The beginning of the pre-ovulatory phase. This is the first day of the period which also signifies the first day of a new cycle. The beginning and development of the cervical mucus symptom. Read on to learn about this. Increased libido- this can make abstinence particularly difficult if you are trying to avoid pregnancy! This is also known as the luteal phase. Very few women have a text book 28 day cycle, or even cycles that never vary from a particular number of days. There are always variations in the cycle length as well as key events within the cycle such as ovulation. This is why the rhythm method is very unreliable for many women. 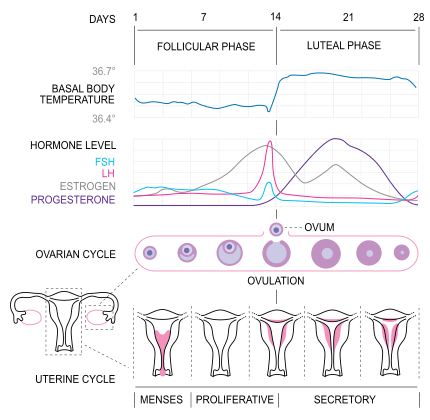 The time from ovulation until the start of the next period is fairly constant in every women and only varies by 1 or 2 days from cycle to cycle. The time between the period and ovulation is not constant. This can vary greatly cycle to cycle. This is known as the pre-ovulatory phase and it is this time which causes irregularity in cycle length. Variations in this phase are common in women who have poly cystic ovarian syndrome or hormonal irregularities. True. You can, but it will always be within 12- 24 hours of the initial ovulation 10-16 before the period so timing wise, you may as well count it as one ovulation event popping out two eggs. It’s fairly uncommon unless you’re taking fertility medications because the process of ovulation causes the level of follicle stimulating hormone- the hormone responsible for releasing the egg, to rapidly decline to the point that further ovulations are impossible. My Fertility Charts– Track your fertility to understand your cycles, take advantage of the ovulation prediction feature. Enter data online or with your handheld device and synch it back to your desktop software. Highly recommended for anyone that is good at keeping records on their computer, smart phone or tablet. Apps are free, desktop version is free, basic online version is free with an option to get advanced premium features for a small fee. Download the Natural Transition fertility chart in MS Excel format or view as a web page. Free chart analysis– If you’d like me to take a look at your charts to help with interpretation, just send me a quick email and we’ll get it happening. Use the booking form below to book your free 1/2 hour chat by phone or Skype. This free call is for you to tell me what your health and fertility challenges are and to ask me any questions you have about how natural therapies can help you. If you decide we are a good fit and you think I can help you, I’ll send you some information about my fertility and preconception health coaching package. This is a no pressure call, simply an opportunity to connect with me and hopefully to gain some useful information. This opportunity is currently available within Australia only.